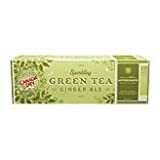 Canada Dry Green Tea Ginger Ale is Ginger Ale flavored with Green Tea. The green tea provides a small amount of caffeine in what would otherwise be caffeine-free ginger ale. Carbonated Water, High Fructose Syrup, Citric Acid, Natural Flavors, Ascorbic Acid (Vitamin C), Green Tea, Sodium Benzoate (Preservative), Calcium Disodium EDTA (to Preserve Flavor). Sugar content: 35 grams (per 12 ounces). How Does Canada Dry Green Tea Ginger Ale Compare? 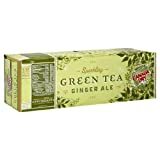 Canada Dry Green Tea Ginger Ale contains 0.75 mgs of caffeine per fluid ounce (2.54mg/100 ml).